In an ongoing effort to improve the air and water quality of San Pedro Bay, the Port of Los Angeles has made additional funding available for its Marina Engine Exchange Program, incentivizing boat owners to replace their older, high-polluting outboard motors with California Air Resources Board (CARB)-certified, “three star”/ultra-low emission-rated engines (up to 10 horsepower). The Port of Los Angeles is offering boat owners 75 percent of the total cost (up to $2,000) to replace old outboard motors with new motors, which includes purchase price, labor for replacement, and recycling of the old motor. New motors meet CARB’s most recent exhaust emission standards and produce 65 percent fewer emissions than 2001 model year engines. Since the Port began offering this program in 2012, nearly 30 outboard motors have received funding, resulting in the reduction of approximately 3,300 pounds of hydrocarbons and oxides of nitrogen annually. 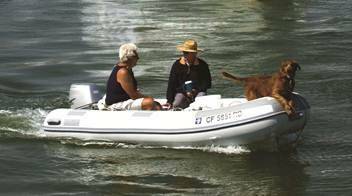 To qualify, an applicant’s boat must have an operational, two-stroke outboard motor no greater than 10 horsepower and be located in a Port of Los Angeles marina. Upon engine replacement, the boat must remain in a Port of Los Angeles marina for at least one year.